Cast and creatives continue to come on board for our 2017 productions. We will be welcoming both new and familiar faces to our stages this year. Here are a few updates about what you have to look forward to. 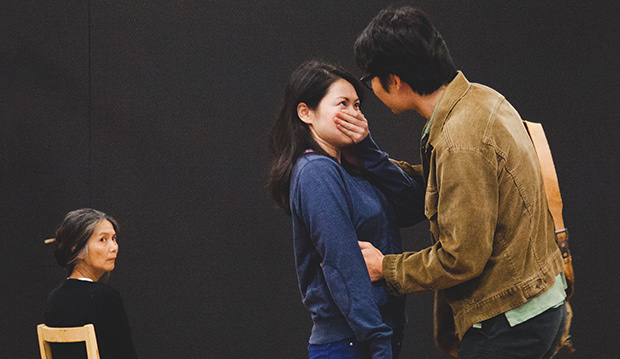 Away is currently in rehearsals and opens for previews at Sydney Opera House on 18 Feb. The full cast of this new production of Michael Gow’s Aussie classic includes Marco Chiappi (Love and Information), Julia Davis, Wadih Dona, Glenn Hazeldine (Disgraced), Natasha Herbert, Heather Mitchell (Hay Fever), Liam Nunan (The Golden Age) and Naomi Rukavina. This production is not going to be like any Away you’ve seen before. Check out photos from the rehearsal room here, discover Dale Ferguson’s costume designs here and listen to our podcast where director Matthew Lutton talks about his different vision for this beloved story. Our Artistic Director Kip Williams is in the rehearsal room at The Wharf with his big cast of twelve for Chimerica. Mark Leonard Winter (King Lear) plays the photojournalist at the centre of the action, and he is joined by Matthew Backer (A Midsummer Night’s Dream), Gabrielle Chan, Jason Chong (Netflix’s Marco Polo), Tony Cogin, Geraldine Hakewill (Disgraced tour), Brent Hill, Rebecca Massey (After Dinner), Monica Sayers, Anthony Brandon Wong (SBS’s The Family Law), Charles Wu and Jenny Wu. We are delighted that Chimerica will also feature 20 students from the National Institute of Dramatic Art. David Fleischer (The Golden Age) is designing the set and Renée Mulder (Endgame) is designing costumes for Chimerica – she is currently sourcing a huge number of authentic military uniforms from all around the world. Take a look at the photos from the rehearsal room here. Nakkiah Lui’s Black is the New White is sold out! We are so happy that so may people have snapped up tickets to see the premiere of this exciting new Australian work. There may be a small amount of ticket released in season. Shari Sebbens (Battle of Waterloo) will play the central role of Charlotte Gibson, with the rest of the Gibson family being played by Tony Briggs, Melodie Reynolds-Diarra, Kylie Bracknell and Anthony Taufa (Love and Information). The other couple in the play are the Smiths, to be played by Geoff Morrell and Vanessa Downing (Power Plays). STC favourite Luke Carroll (The Hanging) is also joining the cast as the narrator. George Orwell’s seminal novel is suddenly more relevant than ever and 1984 is definitely back on people’s minds – sales of Orwell’s book have surged in the days since President Donald Trump took office in the US and his staff coined the term ‘alternative facts’. Tom Conroy (Hay Fever) will play Winston in the Australian season starring alongside a cast of some of Australia’s best stage actors. Paul Blackwell (Vere (Faith)), Terence Crawford, Ursula Mills (Kryptonite), Renato Musolino (Machu Picchu), Guy O’Grady, Yalin Ozucelik (Cyrano de Bergerac) and Fiona Press. Kip Williams will direct a brand new production of Caryl Churchill’s funny, poignant and topical masterpiece Cloud Nine. We’re delighted that STC favourites Heather Mitchell, Anita Hegh (All My Sons) and Anthony Taufa have joined the cast, alongside Harry Greenwood (A Flea in Her Ear), Josh McConville (All My Sons) and Kate Box (ABC’s Rake). There’ll be more cast announcements for Cloud Nine and the rest of our 2017 Season plays over coming months. Stay tuned. If you’d like a refresher about all the plays and how the Season came together, listen to our 2017 Season podcast with Kip Williams and Patrick McIntyre.